Fortunately, I have learned how to take my comforts with me. I got the idea from a guy who set up his big screen TV in the campsite next to me on my last horrid trip. He invited me over for a cold one and we watched the playoffs in the middle of freaking nowhere! So if you want to know how to take your cable TV with you, here’s exactly how you do it. • A satellite dish (DirecTV or DISH Network). • A subscription to the network you’ll be using. • A receiver with the needed power cords. • At least a 25’ extension cord (needs to be heavy duty). • Your choice of a TV with decent speakers – (an LCD TV works best, but you can also use a computer monitor). • A stand or platform for the TV to sit on. • Remotes for the TV and satellite receiver. • RCA cables or S-Video cables. • A power source/supply (this means a gas powered generator or you can use your car battery, but you’ll need an inverter). • Fuel for your generator. • A big ‘ol fat smile; because you’re finally getting what YOU want out of camping. You need an active subscription account to make this work. I tried borrowing my friends and it was a pain. Just get your own subscription. You can set this up anywhere with today’s technology, but you’ll have to make sure you purchase the proper equipment. The disc and portable power supply are the two main keys; the third is a clear view of the (southern) sky. When you go to buy your portable satellite dish, make certain it’s compatible with your system, and make sure to buy a stand. The dishes are meant to be mounted permanently to a home, so the stand isn’t likely to be included. A great option is to invest in a car top or table top dish, the ones used for RV’s. These come with stands and fold down, so they’re easy to transport and they give you good options for mounting. How long will you be using the TV? If it’s more than 3 hours, you may want to consider a gas powered generator, so you don’t wear out your car battery. If the car is the only option, then you’ll need a power inverter to hook to the battery. This will provide regular outlets to plug your system into. • Find a spot with a clear view of the sky. Trees and buildings will mess with your signal. • Set up your dish in a spot with little to no traffic. The back of a truck is perfect. Then lay out the cable from the dish to where you want the TV. Don’t worry about pointing the dish at this point. • Kick on your generator. It’s best to place it as far from you and the TV as possible. Both the fumes and the noise will ruin the experience. • Hook up the dish to the satellite receiver. Find the “satellite in” connector on the receiver and attach the coaxial cable to it. Plug in the receiver into your power supply. • It’s time to hook your satellite receiver to the TV. RCA connectors are the best and the red, yellow and white cords make it near idiot-proof. When you have the TV and receiver connected, plug the TV into the power source. • The onscreen setup is next. Make sure your TV is on the right setting, so you can see the DirecTV/DISH Network startup menu. If you’ve done the steps correctly to this point, you should see “searching for satellite signal,” or something close to that language, depending on the satellite company you’re using. • Grab the remote and use the “menu” button. It should take you to the settings screen where you can use the arrows on the remote to select “setup,” then hit OK. The options available will show up on the left hand side of the screen. • Choose “satellite” and hit OK. This will take you to the configuration screen for your satellite setup. Next, select “view signal strength,” then hit OK.
• Choose “signal meters” and hit OK, which will show you your available signal strength. Once you see the signal meter screen, adjust the volume on the TV; it’s going to make a beeping sound. The faster the beep, the closer you are to success. • The goal is to get 80% signal strength or better. Once you have 80% or more, you’ll be able to go to the satellite “on screen guide” and choose a channel to view. To quit the screen you’re in, hit “done” on the screen and exit the setup. Now you can use the remote and the “guide” button to use the system just like you do at home. • Make sure you take the time to display your genius and manly tech skills with those around you and revel in your success. 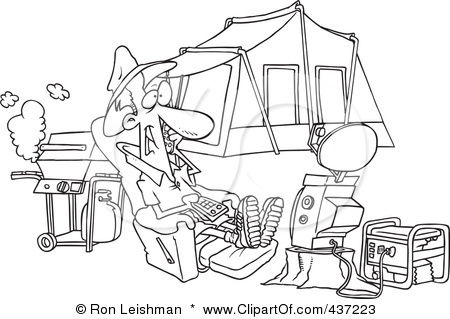 Next time you go camping, do it in style with some of the comforts of home. If you burn the hot dogs, at least you can still watch the game. Lisa is a full time blogger for SatelliteTV.com and enjoys camping only when the right luxuries are involved. If you would like to contact Lisa, send her a tweet @TheLisaForester .